The keto diet provides us with the perfect example of how so many people can interpret the same thing in completely different ways, leading to endless amounts of confusion and debate. Even a question as simple as “how do I follow the ketogenic diet properly?” will attract so much conflicting advice that a keto beginner’s hope will quickly be replaced by overwhelm. What advice should you follow? Who should you trust? In this article, we will help you answer these questions by taking a look at some of the worst pieces of keto diet advice we’ve seen and what may be a better option for you. Do calories really matter? If so, should you track them? Net carbs and fat gain: Will those extra carbs come back to haunt you? Do your cholesterol numbers have any importance if you are following keto? Protein, the keto diet, and ketosis: How much protein should you eat? Should you take ketone-boosting supplements like ketone salts or ketone esters? What should you do if the keto diet isn’t working for you? Keto on or move on? Feel free to click on the issue that is relevant to your current concerns. You are burning fat right now. Eating a higher carb diet will not prevent you from losing fat or using this versatile energy source – let me explain. Fat is such an energy efficient fuel source that we are always “burning” it somewhere in our bodies. More specifically, we usually burn fat to provide energy that allows are heart to keep beating and to fuel exercise (but to a much lesser degree when we do high-intensity exercises that can only be fueled by sugar, like sprinting and heavy weightlifting). One way to increase the amount of fat we burn on a daily basis is by cutting carb consumption. This will keep our sugar levels lower than usual, forcing us to rely on fat to meet a greater percentage of our energy needs. The keto diet restricts carbs to such a great extent that the body needs to produce another energy source known as ketones (from fats and some amino acids) to help fuel the brain while ketones and fat meet the energy needs for most of the cells throughout the body. In other words, keto causes you to burn more fat than almost any other diet because it restricts carbs more than most diets. Follow the keto diet long enough and you will be in a deep level of ketosis, which indicates that you are nearly maxing out your fat burning capacity. After learning these concepts, it is tempting to think that following the keto diet is the best and/or only way to lose fat. However, we must take a look at the bigger picture to uncover the truth. Although it is true that we are burning fat at all times and that we burn fat to a much greater extent when following the keto diet, this doesn’t mean that we are also burning our fat stores and losing fat. To burn off stored fat, we must intake fewer calories than we need to maintain our bodyweight and activity levels (i.e., we must be in a calorie deficit). As a result of being in a calorie deficit, many changes occur throughout the body that cause stored sugar (glycogen) and stored fat to be released into the bloodstream and provide the energy the cells need to sustain themselves. Although eating more fat and fewer carbs – like we do when we follow the keto diet – will cause our body to burn more fat and ketones to meet our energy needs, this doesn’t also mean that we are burning our stored fat. Our stored fat will only be burned when we aren’t consuming enough calories to meet the energy needs of our cells. As we continue to rely on our fat stores by being in a calorie deficit, pounds of fat will slowly melt off our bodies – and this can happen on any diet, even if its high carb. Although I have been diving mainly into the physiology of fat loss, the research confirms my previous points as well. Meta-analyses of the current data on low-carb vs. low-fat diets and keto vs. low-fat diets found similar weight loss results after a year of dieting (with a 2-pound advantage going to the lower carb diets in both cases). The key variable that stimulates your body to burn its stored fat is being in a calorie deficit. This means that you don’t have to be in ketosis to lose fat. Instead, we should be focusing on strategies that help us eat fewer calories and maintain our results in the long run. The keto diet, for example, is a great strategy for many people because it favors the consumption of highly satiating foods that help us reduce our appetite and eat fewer calories. Cut out all processed foods, especially carb-rich snack foods. Increase your consumption of high-protein foods like meat, eggs, fish, and cheese. Increase your fiber intake with low-carb vegetables and other high-fiber foods. Move more throughout the day (go for a walk, convert to a standing desk, take movement/stretch breaks, start working out or taking exercise class, etc.). Track calories and maintain a calorie deficit (30% or less is usually best). Cut portion sizes down by using smaller plates and wrapping up leftovers before you are finished eating. Throw out all unhealthy foods and only have healthy snack alternatives available. All of these suggestions can help you lose weight, but some will work better than others depending on the individual. Keto is not the best way to lose weight for everyone. The current research literature on low-carb vs. low-fat diets and ketogenic vs. low-carb diets strongly suggests that there is little difference in weight loss between each diet after about a year. At best, both low-carb and keto diets have been found to provide an extra ~2 pounds of weight loss after a year when compared to low-fat diets through meta-analysis. At worst, keto diets have been found to have higher dropout rates. Overall, this current data shows us that we should stop looking for the “best” weight loss diet and shift our focus to developing a healthier lifestyle that we will allow us to sustain our results indefinitely. Switching to Keto is not easy for many people. Once we’ve been doing something for a few months that was once difficult, we tend to forget how hard it was for us to adapt to that change originally. The keto diet is no exception. Although some people can transition into the keto lifestyle with minimal struggle, this dietary change may not be simple or easy for others. We must not forget that everyone will react to each diet differently, and keto may not be a reasonable option for some people from a health and/or lifestyle perspective. When weight loss is the main goal, most of us will fail in the long run. In the short-term, most of us can rely on motivation and pure will to help us stick to our diet. However, what will happen when you are tired, stressed, and at your weakest? Will that cookie (or any other previous indulgence) consume your mind until you consume it? The bitter truth is that our food environment will usually prevail, and we will gain most of the weight back. The research indicates that, at best, study subjects were able to sustain 23% of their initial weight loss after 5 years. In other words, if you hit your weight loss goal of 30 pounds, then the research suggests that you would slowly gain ~23 of those pounds back over the course of 5 years. Also worth noting is that people who lost more than 19 kilograms (~42 pounds) with their diet were able to sustain a greater percentage of weight loss (29% instead of 23%). Regardless of how you interpret the literature, one finding that most researchers will agree on is that the majority of dieters will gain most of the weight back. Fortunately, it is possible for us to be part of the minority that keeps most of the weight off for the long-term. However, keeping the weight off requires a different approach than one that simply focuses on losing weight. I speculate that a better suggestion would be to avoid giving or taking advice at first. Asking questions that trigger a deeper understanding of one’s habits and eating patterns may be the better option. For some, the keto diet is a simple and effective way to lose weight and keep the weight off, while others will continuously struggle to restrict carbs, falling into a frustrating cycle of weight loss and weight gain. It is also crucial that we plan for the worst. What will happen when you are stressed, tired, and have no will power left? Will you be able to sustain some of your healthy habits or will you bounce right back to the beginning? To counteract poor eating habits, we must design our healthy lifestyle around our worst habits and triggers. In what way can you change your food environment (your kitchen, car, workplace, etc.) so that you can stick to your weight loss plan, even when you have no will power left? How can you make dieting easier for yourself? Perhaps you need to throw out all the unhealthy foods in your kitchen or reduce your portion sizes. Maybe carrying healthy food options with you on the go will keep you from getting that milkshake and fries. What you choose to do depends on what fits best with your lifestyle and eating habits. And remember, little changes that you can sustain for life will translate to significant improvements in health and body composition months later. Strategies geared toward fast and rapid weight loss may win the sprint, but slow and steady changes will always win the marathon. We briefly touched on the importance of calories in the prior pieces of advice, but let’s dig a bit deeper into this hotly debated topic. Before I started learning about nutrition and reading the diet literature, I was irrationally bullish about the hypothesis that carbs and sugar are the cause of obesity. At that time, I believed that low-carb dieting was the only way to lose fat, and calories don’t matter at all. Then, I looked at the literature, experimented with my own diet, and realized that I was wrong. Calories matter much more than many low-carb advocates are willing to acknowledge. Along with the meta-analyses I mentioned earlier, what solidified the importance of calories for me was a 2017 meta-analysis on controlled feeding studies by Drs. Kevin Hall and Juen Guo. This study compiled and analyzed all of the data available from clinical trials that provided all of the food to their subjects. With this approach, the researchers were able to vary the carb and fat content of each diet and control for other critical variables including calorie intake, protein intake, and activity levels. After their meta-analysis, Drs. Hall and Guo found insignificant difference between the low-carb and low-fat diets regarding energy expenditure and fat loss (with a minor advantage for low-fat diets over low-carb diets). In other words, when it comes changing bodyweight, calorie intake is the most important (but not the only) variable that we should focus on. So, although calorie intake and expenditure aren’t an exact science, we cannot escape the impact that being in a calorie deficit or calorie excess has on our bodies. A calorie deficit leads to weight loss and calorie excess translates to weight gain. This explains why some keto dieters gain fat, even when they are in deep ketosis. In contrast, other dieters – especially those who want to lose a few extra pounds or gain muscle – usually fare better when they track their calorie and macro intake. Like I said earlier, it’s better to focus on long-term dietary strategies that help you keep calorie consumption down than try to follow short-term weight loss fad. Change your lifestyle step by step to something that you can stick to. For some, this many translate to following a simple rule like “eat only keto-friendly foods” so that they can decrease their appetite and calorie consumption. 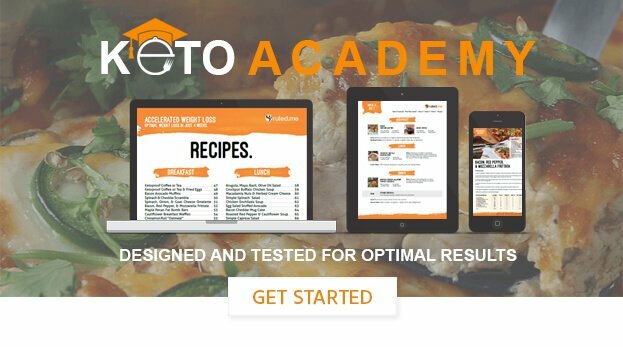 Others may find calorie and macronutrient counting to be a much better strategy (if this sounds like you, we created a guide to tracking macros on keto that you may find useful). What works for you depends on what you can fit into your lifestyle that helps you eat what you need to eat to be healthy and achieve the body composition you desire. For further reading on the science behind calories and body weight, I recommend checking out this article. Limiting sugar intake is great advice, but when it is taken too far, it can make dieting a daunting and confusing task. Once we begin nitpicking every little carb we consume, the keto diet becomes nearly impossible to follow and the chances of you staying with it become much slimmer (especially if your chances are the only thing that is getting slimmer). Fortunately, those extra few grams of net carbs will not impair your results. The only time your sugar consumption will keep you from losing fat is when you are consuming so much that it puts you in a calorie excess. If you recall what we discussed earlier in this article, the literature and physiology of energy metabolism strongly indicate that the key to weight loss is a calorie deficit and the key to weight gain is a calorie excess. In other words, those 2-3 extra grams of net carbs in your favorite food or beverage not be enough to cause you gain fat over the course of your diet (regardless if the carbs are from added sugars or whole foods). However, if that same food contains hundreds of calories that are putting you in a calorie excess for the day and you consume it every day, then you will gain weight overtime. The same concept (with some adjustments) applies to ketosis as well. Eating a lot of sugar throughout the day will prevent you from producing ketones or kick you out of ketosis if you are in ketosis already, but having an extra few net carbs is likely to have little to no impact on your ketone levels as a whole. Just by replacing processed foods with whole foods, our calorie consumption will tend to go down as we feel more satiated, become healthier, and lose weight. This simple piece of advice provides the biggest bang for your buck. In fact, many of the post popular diets today, from keto to vegan and everything in between, provide profound results simply by getting people to eat more whole foods and less processed junk. Cholesterol and heart disease are tricky subjects. Scientists have uncovered the mechanisms that lead to plaque buildup, but a reliable and cheap biomarker for this issue has yet to be discovered. There are simply so many factors that can increase our risk of heart disease that we can’t boiled it down to one test or number. However, this doesn’t mean that blood lipid tests are useless. The bitter truth is that our cholesterol numbers should not be ignored, especially if you are on the keto diet. This is because a small subset of the population can cause unhealthy changes in their cholesterol levels by following a high fat diet. Even if you are losing fat and feel great while follow the keto diet, your blood lipid levels may paint a risky picture for your heart health. This is why it is crucial that you get blood tests and check in with your doctor after any substantial dietary change like the keto diet. Keep in mind, however, that you may end up with healthier cholesterol numbers than ever before as a result of adopting the keto diet (and this seems to be what the majority of keto dieters experience). Although it is true that protein has an anti-ketogenic effect, keeping your overall protein intake low will be a recipe for keto diet disaster. For instance, protein is the most satiating macronutrient, and it will cause you to burn more calories than an equal amount of carbs or fat. This means that increasing your protein intake will help you eat fewer calories while increasing the amount of calories you burn, leading to more fat loss. Protein also plays a key role in how much muscle mass you have, especially when you are trying to lose fat. If protein intake is low while you are in a calorie deficit, then you will increase the chances that you lose muscle mass and burn fewer calories throughout the day. As a result, you will lose a greater percentage of muscle as you lose weight and struggle to lose more weight in the future. But what about protein and ketosis? For the most part, your protein intake will not interfere significantly with ketosis as long as you keep your daily intake within the ranges found below. If you’d like to learn more about protein intake and how it affects ketosis, check out our recent article on the topic. As a general rule of thumb: If it sounds too good to be true, it almost always isn’t worth your time. To this day, not one “fat loss” supplement has been proven to be more effective than diet and lifestyle changes. They typically have little to no significant effect at all. The same holds true for any ketone-boosting supplement. However, that doesn’t mean these supplements are useless. A recent study found that ketone esters lowered plasma ghrelin (our “hunger” hormone) levels, perceived hunger, and desire to eat. It is possible that this may translate to a decrease in calorie consumption, resulting in more weight loss. However, how much weight loss this may translate to has yet to be studied. Also worth noting is the potential that these supplements have for improving cognitive function and exercise performance. Unfortunately, the research on this aspect of ketone supplementation is inconclusive as well. To save you a significant amount of money and frustration, stick to developing a diet and lifestyle that works for you. This approach will provide you with the best results. If you still want to experiment with ketone-boosting supplements, I recommend trying medium chain triglyceride (MCT) oil or powder instead of ketone salts or esters. MCTs are much cheaper, and they have more research backing their ability to increase ketone levels, help with weight loss, and optimize cognitive function. To learn more, check out our in-depth guide on MCT oil. You can lose a substantial amount of weight just from diet alone. Exercise is not required for weight loss. In fact, losing weight by simply increasing your activity levels is much more difficult than eating fewer calories. Why is this the case? Let’s take a look at a hypothetical example to find out. To lose one pound of body fat over the next 7 days, you will theoretically need to maintain a 500-calorie deficit each day. Doing this with exercise would require you to jog for around 60 min each day for seven days (while resisting the urge to eat more if exercise increases your appetite). In contrast, you can achieve a similar calorie deficit by eating 4 fewer pieces of bacon per day or having 4-5 fewer tablespoons of butter or oil each day. Keep in mind that this example is unrealistic. It should only be used to illustrate the point that it takes a lot more effort to lose weight with exercise than it does when we make simple dietary changes. However, just because a lot of physical activity doesn’t translate directly to substantial amounts of weight loss doesn’t mean it is useless. In fact, two scientific papers that reviewed the long-term weight loss data found that exercise is one of the most important variables when it comes to successful weight-loss maintenance. In other words, diet is the key to losing weight, and having a regular exercise routine increases your chances of keeping the weight off for good. Plus, exercising regularly provides us with other health, body composition, and longevity benefits as well. As with our dietary choices, exercise routines should be personalized for each individual as well. Following the latest exercise trend will likely be too much too soon, increasing the chances that we will have lingering injuries, pain, and discouraging experiences with working out. The best approach is a slow and steady increase in activity levels. Try finding activities that you enjoy, something that you want to make a part of your healthy lifestyle. Although some people may benefit from tracking more carefully, we must also consider how keto is affecting each individual’s health, well-being, and how likely they are to stick to the diet for the long-term. If any given diet is a constant uphill battle for months and months, the chances that the person will fall back into unhealthy habits and gain all the weight back will increase drastically. With that being said, many people will struggle for the first few weeks of the keto diet as they move through keto flu symptoms and adapt to the keto diet. Shouldn’t they stay on strict keto until they are keto adapted? The answer is much more nuanced than a simple “yes” or “no.” However, for most people, we recommend sticking with the keto diet for at least a month before deciding what changes you should make next. It meets your micronutrient needs. It provides you with a dietary approach you can use to sustain your results, health, and well-being for the long term. For some people, a well-formulated keto diet will have these four characteristics. They will feel and look better, improve various health markers, meet their nutritional needs, and commit to keto a lifestyle without any issues. In contrast, other individuals may find that keto only exemplifies one or two of these traits for them. They may be losing weight, but their cholesterol levels are a cause for concern. Or they may feel good and look good but keep struggling to stay on the diet because it conflicts with so many other aspects of their life. These examples help illustrate why sticking to keto diet is not always the best option for anyone who is struggling with keto. We must consider other variables in the short-term and long-term that will help us decide if another dietary approach may be more effective for that person. The research literature on the benefits of cutting carbs and being in ketosis is promising and convincing. For example, triglycerides, cholesterol, blood sugar, A1c, and blood pressure have all been found to improve significantly as a result of cutting the carbs (for most people). However, the keto diet has not garnered enough evidence to be consider as a stand-alone treatment for any of these conditions. Although case studies and small trials have shown that different keto diet variations have the potential to reverse certain cancers, type 1 diabetes, type 2 diabetes, and polycystic ovary syndrome, this does not mean that keto cures these conditions. There are too many confounding variables and nuances with each study and condition to conclude that the keto diet should be the stand-alone treatment. For the conditions listed above, the keto diet, cutting carbs, and/or boosting ketone levels with supplements may be a great addition to the treatment plan. Which strategy you chose depends on what the person can safely implement and what has been found to work best according to the research. Although we spent this article focusing on some of the worst pieces of keto advice, it is important to realize that the same advice can be both good and bad, depending on the person that applies your advice. This is why we tried to take a more individualized, all-inclusive approach to keto diet advice that is helpful in some way everyone who reads it. Calories are the gate keeper to weight change. The most effective way to change your body weight by manipulating calorie intake. To gain weight, we must maintain a calorie surplus (i.e., eat more calories than you need to maintain current weight). To lose weight, we must be in a calorie deficit (i.e., eat fewer calories than you need to maintain weight). This principle applies to every diet and explains why the research has shown little to know difference between low-fat and low-carb diets for weight loss. Meet your macronutrient needs micronutrient-dense foods. In other words, cut out the processed foods and eat more whole foods. Some of the most micronutrient-dense whole foods are eggs, low-carb vegetables, seafood, and organ meats like beef liver. Leverage the power of protein. Make sure you are eating enough protein for best results. Even if you are not lifting weights, eating enough protein is crucial to your keto diet success. When you meet your protein needs, you will reduce your hunger levels, burn more calories, and help preserve muscle mass, all of which will help you lose more fat while looking and feeling healthier. Physical activity plays a crucial role in diet success. Just by incorporating exercise into your daily life, you can help optimize your health, improve your lifespan, increase the percentage of body fat you lose, and increase the chance that you sustain your diet results indefinitely. Be mindful of your health and well-being. Just because you are losing weight on a diet, doesn’t mean you are also getting healthier. Make sure you are keeping track of your blood work and your mental health. If they are not trending in the right direction, apply the other diet and health principles in a way that is easier and healthier for you. If it sounds too good to be true, it almost always is. This applies to everything from weight loss supplements to diet fads. Focus on creating a healthy lifestyle that helps you reach your goals rather than looking for the quick fix. Take a look at the bigger picture. The promise of rapid weight loss and incredible energy levels is seductive and motivating, but we must also consider long-term adherence. Can you stick to your diet plan when the excitement fades, and you are stressed, tired, and at your weakest? Is following your diet a constant uphill battle that never seems to get easier? What will prevent you from keeping the weight off for the rest of your life? Questions like these can help you uncover and address potential road blocks, so they don’t impair your future progress. No matter what diet you follow, you can use these seven principles to help you formulate a diet and lifestyle that works best for you.